Arranging an interview with the vice president of the Azerbaijan cycling federation proved to be considerably easier said than done. The man in question, Sahib Alakbarov, likes to take a hands on approach to race organisation. When he’s not handing out prizes and jerseys, he floats between TV interviews, stopping to direct traffic and instruct various race officials, who scuttle away like reprimanded students. It’s hard to imaging his European equivalents doing the same. 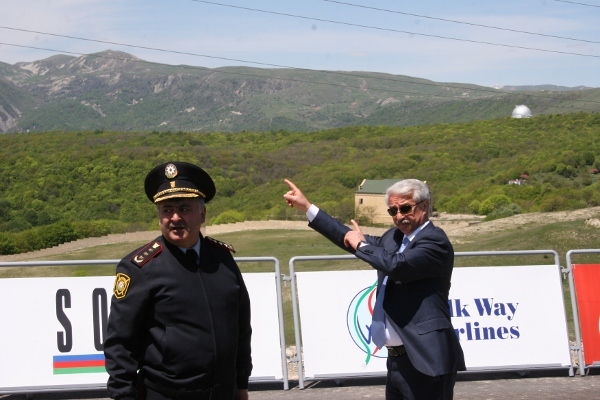 CW eventually managed to corner him and his interpreter, a matter of minutes before the third stage start in Qabala, the ancient capital of Azerbaiijan and a five hour drive west of the modern day capital, Baku. “Of the world’s 11 climatic zones, Azerbaijan has nine,” Alakbarov proudly boasted, in a way that suggested that with a little more work, 10 or 11 would be possible. Sitting in the shade of the county hall though, a legacy of the Soviet era, his point could not have been more pertinent. Surrounded by lush green hills and soaring mountains, Qabala felt like a different country to the previous days in Baku. That’s not to say it felt any less exotic. 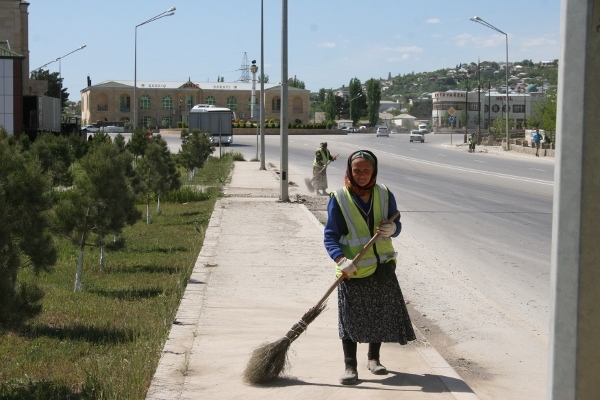 Qabala, nowadays a small agricultural town, tingles with activity. Men with rows of gold teeth sit and drink tea while Lada after Lada buzzes down the towns potholed streets. Market traders proudly show off their goods – ranging from chickens of various ages to baby’s cots. Up the road is a five star hotel, next to which is a children’s theme park called Qabaland. Down the road is a Russian radar station used to monitor Iran and the Indian Ocean during the Cold War, only abandoned at the end of last year when the Azerbaijan government decided to raise the cost of the lease. 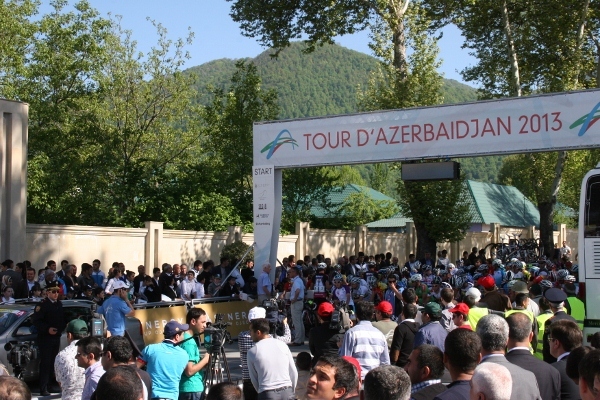 You’d be forgiven for assuming that a town like Qabala would care little for bike racing. Yet lining the roads, leaning out in anticipation, are hundreds, if not thousands, of people. Most are concentrated by the county hall, location for two stage starts and a stage finish, but small groups of fans extend for miles out of the town. Even on the summit finish of stage four, won by Leopard-Trek’s Jan Hirt, crowds gathered from the local villages to wave their national flags and enjoy the spectacle. Unfortunately none spoke English (apart from being able to recite four or five Premier League football clubs) so I couldn’t ask them exactly what they thought of the latest addition to their fast-changing country. But going by the signs, smiles and thumbs up, I think they like it. It’s easy to be dismissive of cycling’s ‘globalisation’ when you watch the peloton fly past the empty roads of the Tour of Qatar. But Azerbaijan teaches you that, apart from the visa-less Paraguayan riders on the Start-Trigon team, the appeal of bike racing doesn’t have to stop at borders.